DOC NYC’s Visionaries Tribute, held on Friday, was one of the most significant gatherings of documentary filmmakers in history. The event was host to the likes of Albert Maysles, D.A. 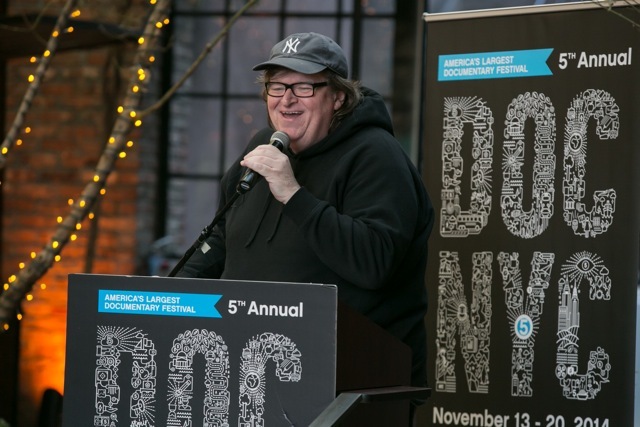 Pennebaker, Chris Hegedus, Barbara Kopple, Dan Cogan, Rory Kennedy and Michael Moore, who all took part in this year’s tribute to documentary film and the extremely talented filmmakers who have made doc history. The afternoon featured four awards, one of which, the Robert and Anne Drew Award for Documentary Excellence, was a new addition this year. That award was presented by James Marsh (director, “The Theory of Everything”) to Laura Poitras, whose film “Citizenfour” has been a much talked about shoo-in for an Oscar nomination. The Leading Light Award was presented by Rory Kennedy (director of “Last Days in Vietnam”) to Dan Cogan, executive producer of opening night film “Do I Sound Gay?” as well as other doc fest favorites from this year such as “Meet the Patels” and “Vessel.” Friday just so happened to be Cogan’s birthday and Kennedy led the crowd in a rousing “Happy Birthday” sing-along before presenting him with the award. Two Lifetime Achievement Awards were presented; the first by Barbara Kopple to legendary filmmaker Albert Maysles, whose films “Gimme Shelter” and “Grey Gardens” changed the face, and path, of documentary filmmaking. Maysles’ only equal in both prestige and age was the second recipient, D.A. Pennebaker, who, along with his spouse and filmmaking partner Chris Hegedus, was presented with the second Lifetime Achievement Award from Oscar-winning documentarian Michael Moore. No doubt many documentary filmmakers in the room felt exactly the same way.